Yellow, yellow, yellow! I wake up in a cold sweat. It’s just a dream or is it a nightmare? It can’t be true. I jump out of bed and open my front door and lo and behold a carpet of color unfolds in front of me. Daylilies do come in more than yellow. Stella De Oro is not the only plant available. 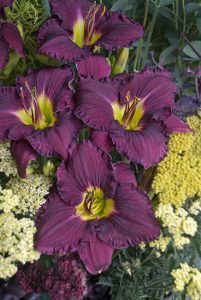 According to the American Hemerocallis Society (www.daylilies.org) there are more than 70,000 cultivars of daylily available today. In our garden we have over 300 varieties with no repeats. We are not hybridizers, we are collectors. We let others do all the work, we just enjoy the fruits of their labors. We have creams, violets, purples, reds, pinks, oranges and even a couple of yellows. By the way there are over 50 different shades of yellow out there. So if Stella is your thing, there are yellow flowers of different styles also available. You can find bloom shapes that vary from miniature (less than 3 inches) to extra-large (more than 10 inches), spiders (petals and sepals that are thin and wiry), petals and sepals that are twisted, fat, or round. Blooms that have teeth, edges that look like chicken fat. Blooms that have patterns, multi-color, with eyes that range from green to almost blue. At this time the only daylily flower color that is not quite there is a true blue. Some hybridizers think they have gotten there and they use “blue” in the name, but these are usually a light lavender disguised as blue. The big box stores will have a sampling of plants, but they are trying to sell more than daylilies. 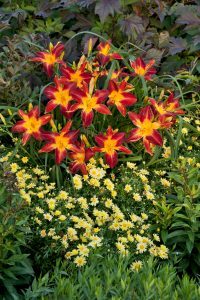 Locally, there are several gardens that specialize in daylilies and will have anywhere from several hundred to several thousand plants to choose from. During the summer months, these gardens will be a sea of color. It will take several hours to just look, let alone pick and have them dug up for you. Deer you say? Yes, the daylily bloom bud is a tasty treat for deer. But there are ways to mitigate the problem. There are several sprays that are a deterrent and they do work if you are diligent with the program. Rain will wash the spray off but, it is easy enough to respray. After a while the deer will get the message and go elsewhere to find something to eat. There is also a local club that is dedicated to the education and cultivation of daylilies. 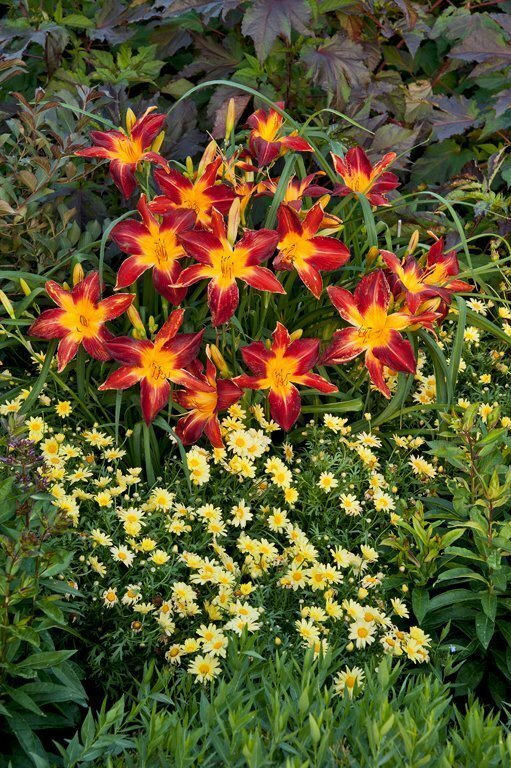 The Raleigh Daylily Club meets the second Tuesday of each month, 7:15pm to 9pm, from February through October at the Powell Drive Community Center. The public is welcome. We also have a web site, www.ahsregion15.org/clubs/raleigh. Steve Edwards is a member of the Raleigh Daylily Club.